An almost no-cook way with pasta that’s light, fresh and tasty. This is the way to make pasta on a warm day when you need something fresh, light and easy but properly comforting (thank you, carbs) to eat. It’s not quite no-cook, but it’s pretty close. As you’ll read below, the pasta is only boiled for two minutes – and it ends up perfectly al dente, I promise. You can, of course, use this technique to cook pasta at any time of year, though it is particularly welcome in the hotter months. 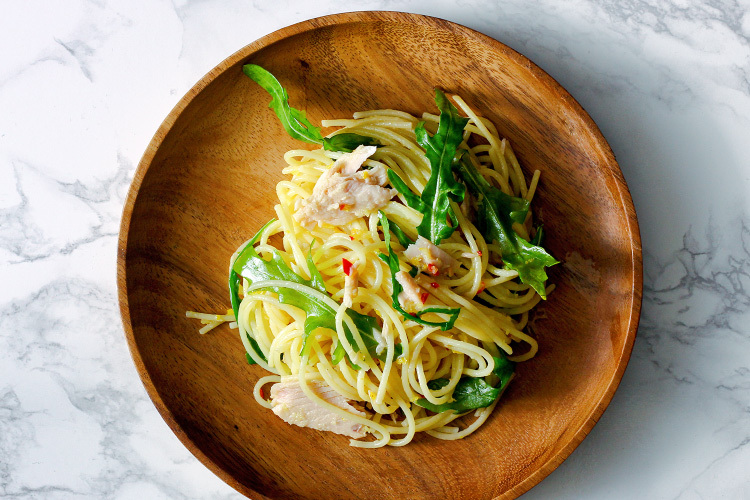 Tossed with tuna and rocket, you dress it a flavour bomb of extra-virgin olive oil infused with lemon and chilli. It’s great served straight away, though you should know that it works just as well at room temperature. In a small bowl, stir together the extra virgin olive oil, lemon zest and chilli. Set aside. Bring the pasta water to the boil, adding a tablespoon of sea salt flakes for each litre of water. Add the pasta, stirring gently as it softens. As soon as the water comes back to a full, rolling boil, start a timer: let it cook for two minutes, then remove from the heat. Cover the pot with a clean tea towel and put the lid on. Now start timing again. Leave the pasta, covered, for the amount of time the packet recommends to cook. To be clear: if the packet says to cook for 10 minutes (“cottura 10 minuti”), let it boil for 2 minutes and leave it, covered and off the heat, for another 10. Drain the pasta and transfer to a large bowl. Quickly toss through the rocket leaves until they wilt a little. Flake in the tuna with a fork, pour over the lemon-chilli oil, season with salt and pepper and toss again.